Macaroni and Cheese! Is this too cheesy!? 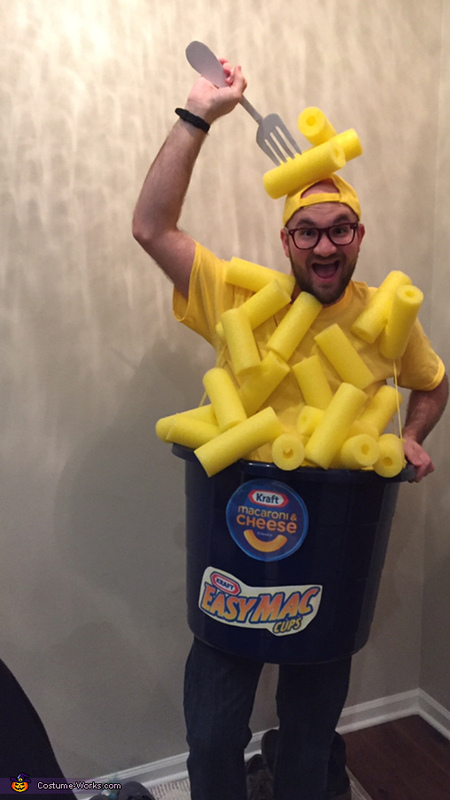 This costume was a DIY costume that made me hungry!! It fits my personality, and it's good for any age! 1. Cut pool noodles into small macaroni pieces. You should have around 20-25. 2. Cut bottom of blue bucket out to stand inside it, and add yellow string in holes to hold it on you! 3. Hot glue the pool noodles onto the shirt, hat, and bucket, in a fun and criss-cross pattern. See pictures for ideas. 4. Make labels for the macaroni and cheese, how ever you prefer! 5. Cut out fork shape out of cardboard and stick it in, and glue it into the pool noodle on the hat. See picture. This is my favorite costume that took me a long time to make, so worth it!